Adjusting the position of your computer keyboard to prevent carpal tunnel syndrome. Being sure that the height of your desk chair allows your feet to rest flat on floor. Learning the right way to lift heavy objects to prevent back injuries. Using handle coatings or special gloves to suppress vibrations from power tools. 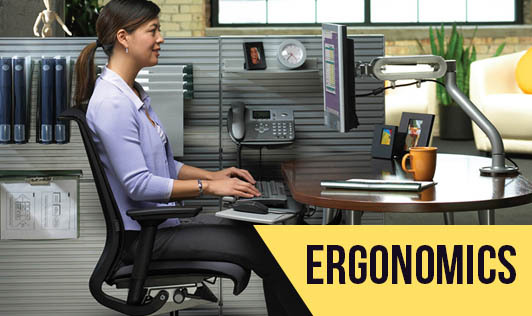 Ergonomics is employed to fulfill the two goals of health and productivity. It takes account of the user's capabilities and limitations in seeking to ensure that tasks, equipment, information and the environment suit each user. Ergonomics in the workplace has to do largely with the safety of employees, both long and short-term. Ergonomics can help reduce costs by improving safety. Through ergonomics, workplaces can be designed so that workers do not have to overextend themselves. Many times this involves manipulating an individual's work area so that it fits them better, e.g., they can work in neutral postures and maintain their curves. Workplaces may take the reactive or proactive approach when applying ergonomics practices. Reactive ergonomics is when something needs to be fixed, and corrective action is taken. Proactive ergonomics is the process of seeking areas that could be improved and fixing the issues before they become a large problem. Problems may be fixed through equipment design, task design, or environmental design.